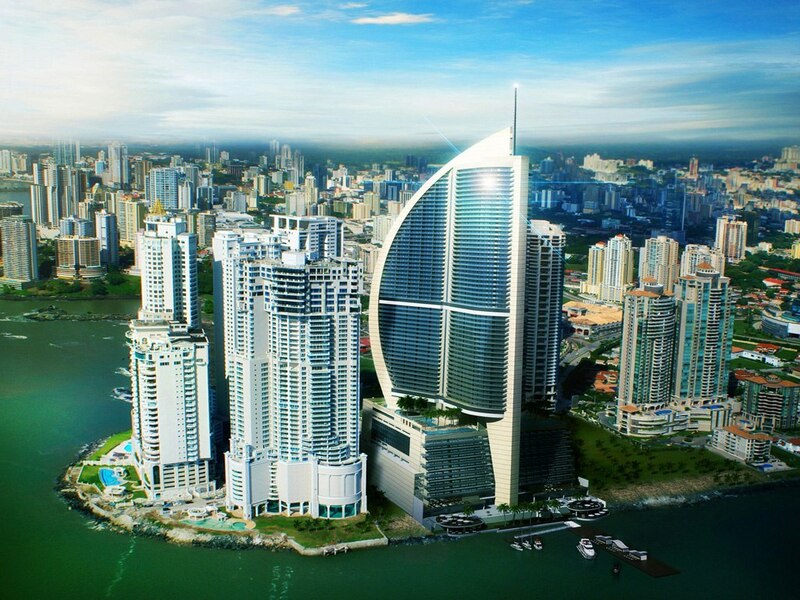 Flyte Systems expanded its international presence with the announcement that the Trump International Hotel & Tower Panama implemented the FlytePass boarding pass printing travel service. 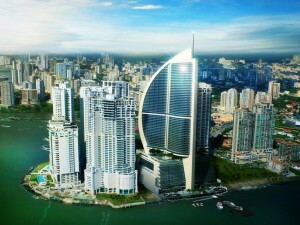 FlytePass enables guests to confirm flights and print boarding passes in the comfort of the Trump Panama Business Center. 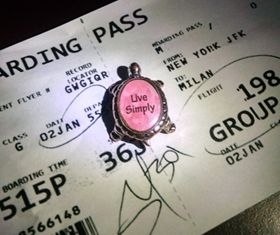 I am in the travel business, but regardless of how often I fly I still feel anxious 24 hours prior to my departure. I usually cannot relax until I am on the plane. Add winter weather like we have had this year and anxiety is doubled. With experience I have learned that if I do a few simple things, my “mental travel tool kit” is ready for almost anything. Flyte Systems announced it will add a new feature to its FlyteBoard real-time flight information displays on December 24. 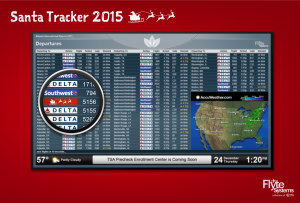 The company’s flight information displays are installed at airports, hotels and other travel-related businesses worldwide. This holiday season, FlyteBoard will provide the ability for clients and their customers to track Santa’s travel status from the North Pole across the U.S. on Christmas Eve. 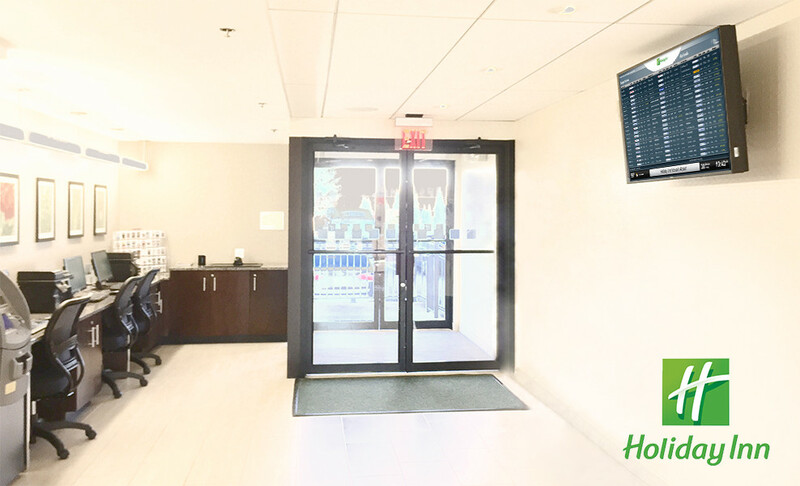 Flyte Systems announced it added custom airline arrival information to its existing travel services at Holiday Inn Washington Dulles International Airport. The new service is a URL accessible on mobile or desktop devices that lets property staff see real-time arrivals for a major air carrier the property serves. The arrival updates will enable the property’s shuttle team to pick up airline crews minutes after their flight lands and drive them to the hotel quickly for their layover. Click here to request information on Flyte Systems’ airport travel and guest information services. Air travel is more demanding than ever, and winter is coming. 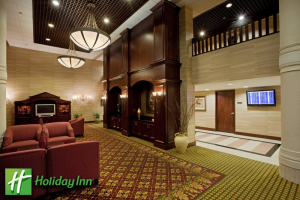 The busy 191-room Holiday Inn Newark Airport, across from Newark Liberty International, understands this and is ready. 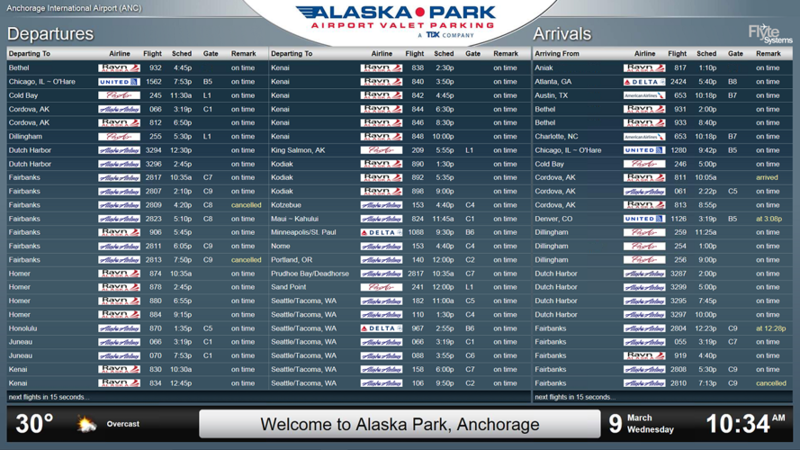 The property recently installed the FlyteBoard airline information display by Flyte Systems in its lobby to give guests real-time flight information for more relaxed travel plans. 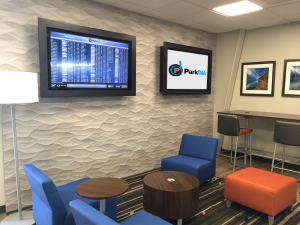 Flyte Systems is the leading provider of cost effective airport travel information displays and digital signage content for the hospitality, corporate training center, digital signage and convention center industries, and related businesses. Flyte Systems is a division of Industrial Television Services (ITS), based in Chicago. ITS is a leading digital signage solutions company with more than 50 years of experience specializing in real-time information delivery. Click here to request information on Flyte Systems’ airport travel and guest information services. InfoBoard’s interactive touch screen allows guests to instantly, independently retrieve information. The new, 116-room Hampton Inn & Suites DFW Airport South managed by Whitestone Hospitality Management will install the InfoBoard interactive virtual concierge from Flyte Systems. 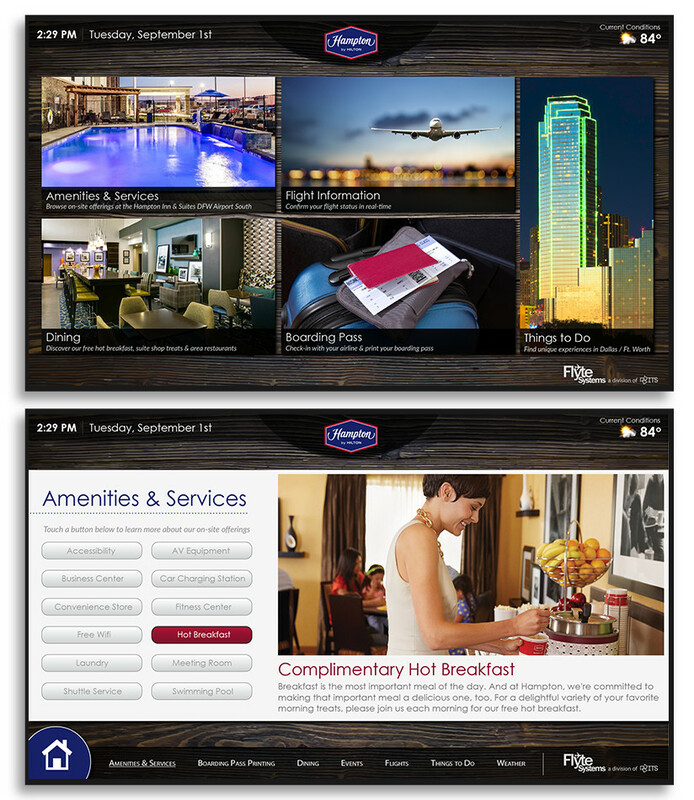 InfoBoard reduces guest inquiries by providing local events and attraction information, property dining specials and amenities, as well as property wayfinding, and real-time flight information and boarding pass printing for Dallas/Fort Worth International airport. The comprehensive interactive display lets guests gather their own information, which allows property staff to concentrate on other visitor needs. Flyte Systems is the leading provider of cost effective airport travel information displays and digital signage content for the hospitality, corporate training center, digital signage and convention center industries, as well as other related businesses. Flyte Systems is a division of Industrial Television Services (ITS), based in Chicago. ITS is a leading digital signage solutions company with more than 50 years of experience specializing in real-time information delivery. Click here to request information on Flyte Systems’ airport travel and guest information services. Flyte Systems announced that the newly opened Hilton Garden Inn Boston Logan Airport will install the FlyteBoard real-time airline flight schedule display to simplify guest travel plans. Flyte Systems is the leading provider of cost effective airport travel information displays and digital signage content for the hospitality, corporate training centers, digital signage, convention center industries and related businesses. Click here to request information on Flyte Systems’ airport travel and guest information services. Hilton Garden Inn Boston Logan Airport is located one mile from Logan International Airport and provides a complimentary 24-hour shuttle service to the airport, MBTA Subway and local area businesses. The new hotel, owned and managed by First Bristol Corporation, offers high-end amenities and welcoming services for travelers to sleep deep, stay fit, eat well and work smart while on the road. 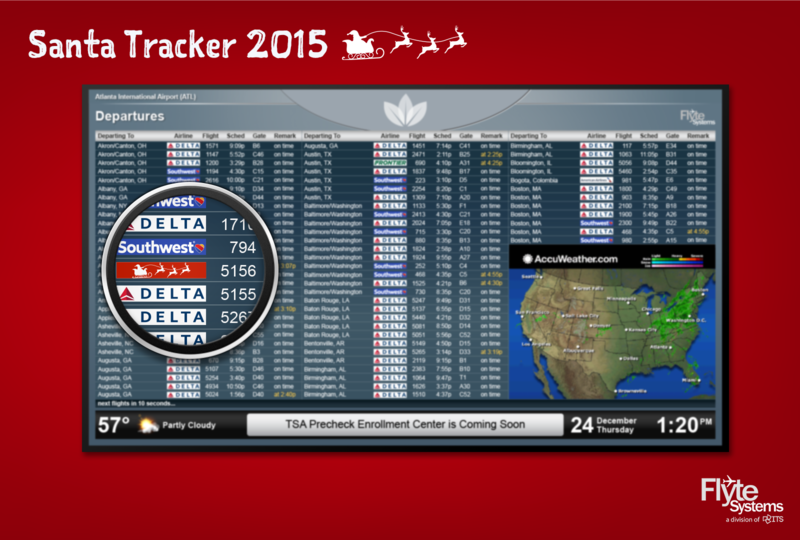 The new Travel-Event-Amenity display provides guests with flight information, combined with property events, promotions, and area activity announcements. 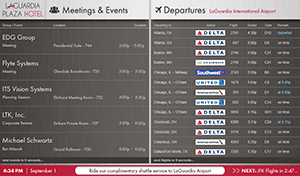 The LaGuardia Plaza Hotel partnered with Flyte Systems to launch a new Travel-Event-Amenity display that provides guests with flight information, combined with property events, promotions, and area activity announcements. 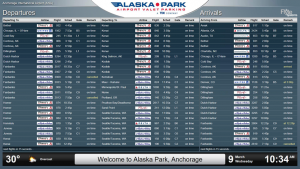 Flyte Systems supplies online Event Portal content that alternates airline departures for LaGuardia and John F. Kennedy International Airports with time-sensitive property-configurable content and local attractions to keep on-the-go travelers informed. Flyte Systems is the leading provider of cost effective airport travel information displays and digital signage content for the hospitality, corporate training centers, digital signage, convention center industries and related businesses. Click here to request information on Flyte Systems’ airport travel and guest information services.